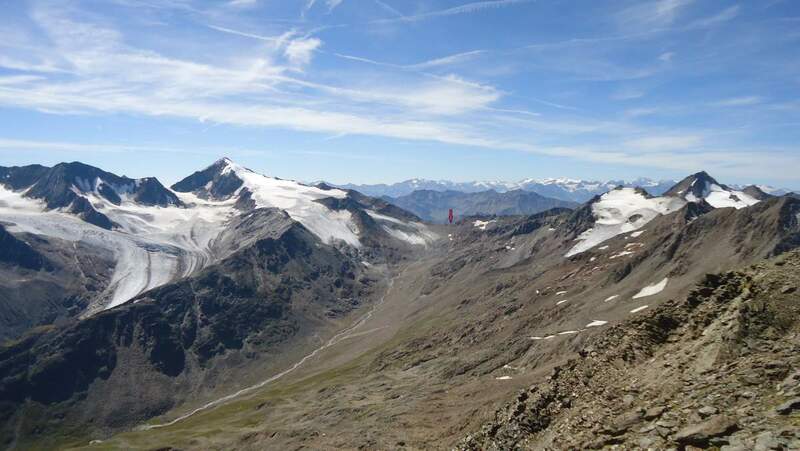 Similaun (3606 m, or 3603 m according to Wikipedia) is a great glaciated mountain at the Austrian-Italian border. It is on the east side of the Niederjoch (Nieder pass, 3019 m or 3017 m depending on source) where the Similaun hut is located. The mountain is a popular destination, climbed from both Italian and Austrian side. The Italian normal route is from Vernagt. It will take you up to 4 hours to the hut. It is much shorter and steeper than the Austrian route. Similaun on the left. The hut position at Niederjoch is marked. 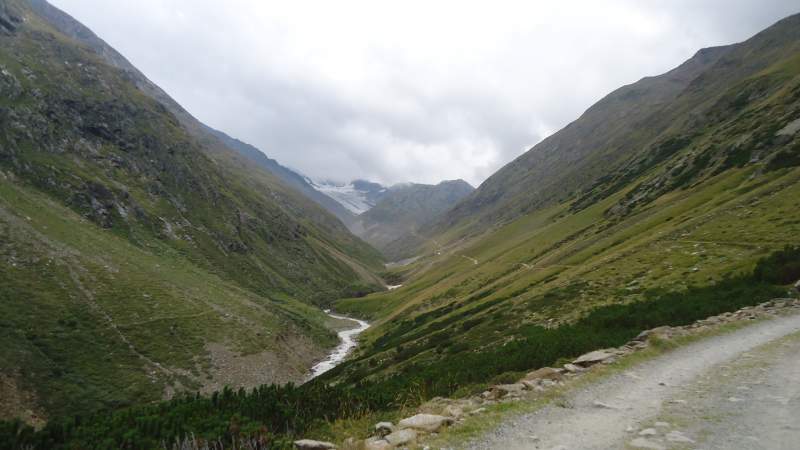 Photo was taken from the route to Kreuzspitze. The normal route from the Austrian side starts in Vent. This is a long approach along the Niedertall and I am sure not many people climb it directly from the village. 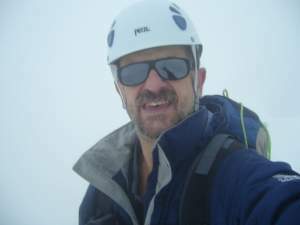 There are two good huts on the route, Martin Busch (2501 m) hut and the mentioned Similaun hut (3019 m). The signs at Vent tell you that for the Martin Busch you need 3 hours but you can do this comfortably in less than 2 hours. There are possibilities to transport equipment to the hut. I have not seen them transporting people. From the Martin Busch hut to the summit you will need another 4 hours, plus/minus half an hour or so, depending on your physical conditions. From the Similaun hut, you will need less than 2 hours to the summit. This is a glacier walk all the time, so you will need a proper equipment for glacier climbs, definitely a pair of crampons. 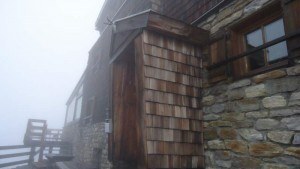 The Similaun hut at Niederjoch pass is privately owned, built more than a century ago. The hut phones are: +39-0473-669711; +43-5254-30122; mobile: +43-676-5074502. It is at a stone throw from the place where the Ötzi mummy was found in 1991 (see a nice National Geographic video on my page about Kreuzspitze). It is believed that the Otzi man was walking 5300 years ago from the Italian side. According to the maps, it appears that the Similaun hut is formally on the Italian territory, though I doubt that anybody takes care about this, except tax officials, they surely do. Mountaineering boots appropriate for crampons. For the clothing in the Alps in general, please see my another text. For more details about these elements of the equipment please visit my separate page on this site. This is an unfinished business for me from August 2015; no, I did not get to the summit. 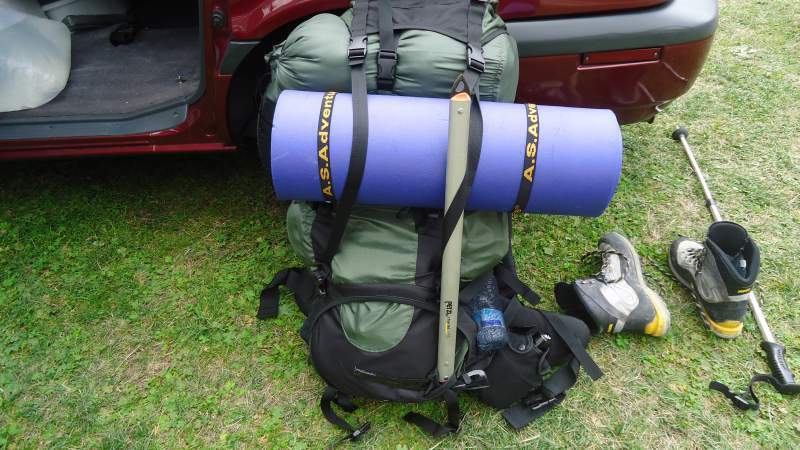 I started with a great idea to spend two days camping in the mountains. So naturally, my legs were shaking when I first put the rucksack on my back in Vent, you can see it in one of the pictures. I knew the weather was unstable, but I believed I would manage it. I have such ‘bright moments’ from time to time. So this was a long and heavy walk. My initial plan was to go as high as possible along the Niederthal in order to have an easier climb to the summit next morning. (Note this is not Neanderthal, but there was one Neanderthaler walking the route that day). After passing the Martin Busch hut, I continued until I was in clouds, at around 2850 meters altitude. Then an icy cold rain started while I was in a rather bad terrain where it was not possible to put the tent anywhere. 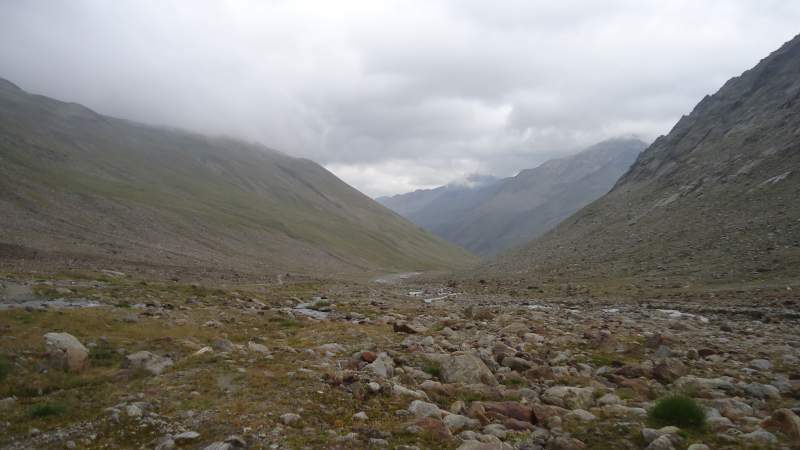 I was looking around, my tent was out of the rucksack, everything was becoming wet quickly. I could not do without my waterproof glows, but putting the tent with glows, well, try it once. The situation was becoming rather bad, so I collected the things and decided to continue toward the hut. I knew it was relatively close, but the visibility was just a few meters. The nice picture on the top of the page was taken in some other occasion. It was quite different that day. The signs were not visible, so it was hard to guess where to go, and the night was coming. But you are reading these lines, so I did not end up there like the Otzi iceman. At one moment the hut appeared a few meters in front of me. I was safe. A long night followed in the hut. Around 10 people in the room, it did not look good, somebody always snores. But surprisingly, not this time. It was not so bad except for frequent walks of some of them to the toilet. Beer and high altitude combined are not good if you plan to sleep (or if others around you plan to do so). Next morning I felt miserable. I asked the owner to leave most of the stuff if I go to the summit, he said OK. But the weather was the same, everything was in clouds and I was supposed to climb up the glacier. I did not even know in which direction the Similaun summit was. 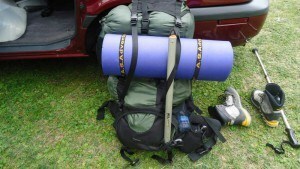 My heavy backpack with all camping stuff. The lower part of the long walk toward Similaun. Useful information at Martin Busch hut. The upper part of the route above Martin Busch hut. In front of Similaun hut (3019 m). The rest you can guess. But, my story is not finished. Climbing Similaun will have yet another episode. The great mountain is still there and the weather can be gorgeous as you may see from the first picture. Stay tuned. Please leave some comments in the box below. I love to read them. Below you may see 2 YouTube videos of climbing Similaun. 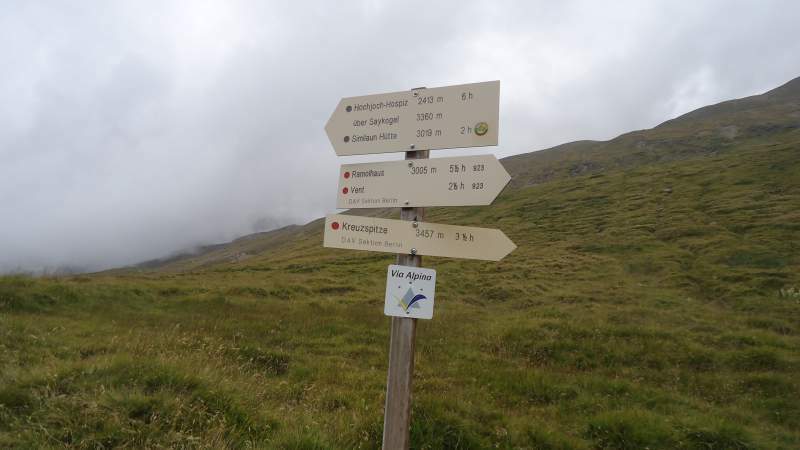 The first shows the route from the Austrian side and the second from the Italian side. When you do another attempt to climb the Similaun consider to climb the Fineilspitze too. 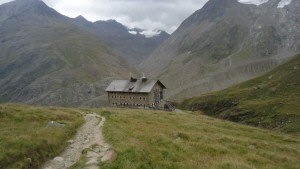 When you come back from the Similaun you can spend the night in the Similaunhutte and leave the hut next morning and climb the Fineilspitze. I climbed the Fineilspitze last year and it was a great climb with a very nice view (when you have good weather 😉 ) from the summit. Hi Sander, thank you, great to read your text. 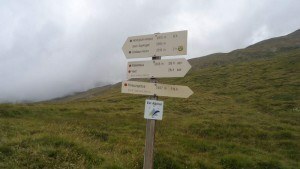 In fact Fineilspitze was part of the plan, that is why I was carrying camping stuff. I wanted to stay 2 nights over there. I think I have seen the sign for the route below the hut. This is for next summer for sure. If you need any info how to climb the Fineilspitze don’t hesitate to contact me! Thanks a lot, I appreciate this. Next summer I am there again. All the best. Hi Nichole, you sound like my wife now, mountains perhaps in pictures only, but I forgive you. Thank you for reading my text and for the comment, this means a lot to me. I see that episode as a huge disappointment with myself, but you put it politely as an accomplishment, so thanks again, very kind of you. I really enjoy hiking and rock climbing. From the pictures Similaun looks like a really nice place to go. Maybe one day when I have the time I could go on some hiking adventures. From your experience, what would be the number one piece of advice to give anyone who is interested in hiking? Hi Bryan, many thanks. You ask a very difficult question. I know how to answer but you will not take me seriously when you hear it: have a partner. I myself do not have one, and it is not good to be there alone. Not silly at all. Its the same thing for rock climbing. Thanks for the fast reply! OK, thank you, so you understand it very well. Best luck.